Thursday, July 3rd was a great night for Shameboy. After all, they were asked to play that evening from 20:35 until 21:35 at one of Belgium’s (and Europe’s) most famous festivals: Rock Werchter. When it came to performing, Luuk Cox and Jimmy Dewit had already quite the reputation but performing for thousands of people in the Pyramid Marquee must have even been daunting for them too. But they ended up burning down the house with an energetic, feverish set. No wonder the crowd went completely out of its mind. The biggest Belgian newspaper called it “the first splinter bomb of the festival” and they were right. The performance was nothing more than a raw and dirty electronic joyride. Belgian electro at its very best. 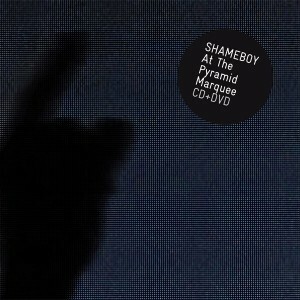 Now, one year later, Shameboy have decided to release the concert on a CD+DVD set. And that’s a good thing, not only because the music is as relevant as it was one year ago, but also because the energy of the evening oozes out of your speakers with each and every track. The bonus DVD is a big plus, seeing that this wild and trashy ride is not only something to hear but to experience with all your senses. You will find all the big club hits of Shameboy on this album: Rechoque, Strobot, Splend It, Heartcore. Each of these tracks remains invigorating. As if a shot of adrelines is administered directly into your heart. Needless to say that playing this in your car at night, when driving to (or coming home from) a party, is a real joy (the fact that your speed increases with every track is something to watch out for ;-)). But also the lesser know tracks Stumble, Sunday Punk, Monofour, Slacks and Timeskipper will have to same effect on you as they do on the crowd who could not stop jumping, dancing and shouting. And the curiously titled Our Peggy Ate Her remains a killer piece. So, there’s no new work on this, but is that a bad thing? Not at all, seeing that this is all about having a festival in your house, car, iPod … And that’s exactly what you get: 10 hot, dirty, electropunk tracks, expertly brought live to you by Shameboy. Definitely check this one out, it’s a great preparation for the next festival season. Don’t forget to check out our Shameboy artist page!